Do you work for Balenciaga? I know there have been very few posts in the past couple days-- I can assure you it is not (totally) slacking on my part-- there is just not a lot going on. This weekend I depart for Seoul, Korea, and, barring any antics on the part of Dear Leader, will be back after the 4th of July. Why am I going to Seoul? Well, the flights were just so cheap. With Singapore Airlines offering a roundtrip fare for only $600 out of SFO, I couldn't say no. I'm not even Korean, and Seoul isn't really near the top of my list, but how often does an offer like that come around? (Answer: not often, as usually the price is around $1000.) And it's Singapore Airlines, which will hopefully not drive me to dig into my emergency stash of Ambien. So I may post here and there, but it will probably be more personal-- about my experiences shopping and eating in Korea. Incidentally, there will not be a lot of sample sales going down near/over July 4th, so concentrate your shopping efforts on standard retail outlets: department stores and chains (J.Crew, Banana Republic, H&M, etc). These will probably have great sales over the holiday weekend. If you have the stomach, I would also advise you to check out your outlet mall. It will be madness, but the discounts should make it worth it. In parting, I wish everyone a safe and happy July 4th! I suppose what we had a week or so ago was just a sneak peek, for the 'full sale' has gone live. I wasn't going to post this (with all the sales going on, 25% seems like a pittance). However, it is a VERY slow news day, and I suppose if you are dying for new jeans, 25% is better than nothing! No code, prices go back up Monday, Jun 29. Bumrush your nearest store or be speedy with the mouse. Free shipping for $175+ through Thursday, Jun 25 with code "BEACH". Check it out. Includes BCBG, Lucky Brand, Tommy Bahama, Gottex, Milly, Vitamin A, Michael by Michael Kors, Betsey Johnson, and others, all 40 or 50% off. The city's most anticipated sample sale is back with 70-80% off retail. 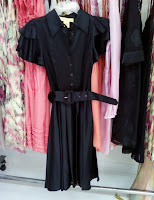 Vivienne Westwood dresses are now $190, originally $750. Other international designers including Ilaria Nistri, beat3ez, Iodice, Scatola, and J4 are on sale starting at $29. Print the TopButton ad to play the "Lucky Draw" raffle at the check-in desk, and win up to $1,000 in free merchandise. ShopBop.com has selected 100 items on which you can take an additional 20% off. Use code "BONUS20". Ends Tuesday, Jun 23. 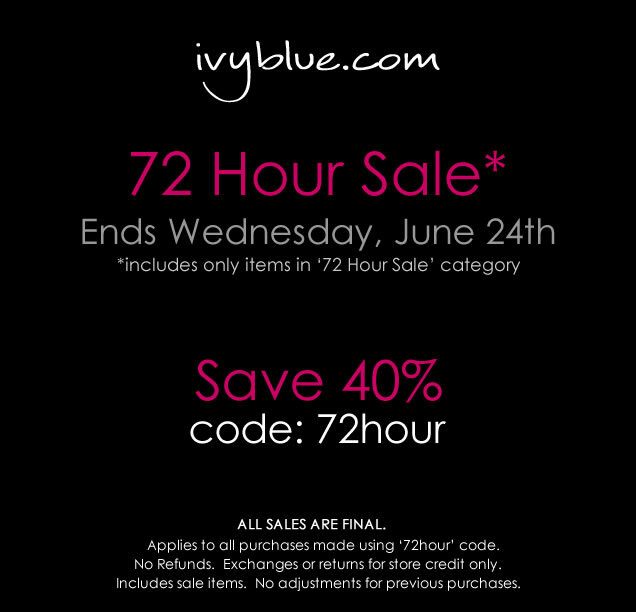 IvyBlue.com has selected 143 items on which you can take an additional 40% off (some are already on sale too). Use code "72HOUR". Ends Wednesday, Jun 24, but bear in mind that these are final sale. Free shipping if you go through my link. Update: Their PR just told me they take credit cards too! Even better! Help Alice + Olivia get rid of their spring merchandise, including dresses, jumpsuits, boyfriend blazers and shorts. Up to 70% off, bring cash. Fendi sample sale. If these words don't set your pulse racing, then you might want to pass on the chaos and madness that will definitely, absolutely ensue. RTW, handbags, small leather acessories, and fur. I suggest showing up with nothing but your credit cards ready to go. CC only (MC, Visa, Amex). 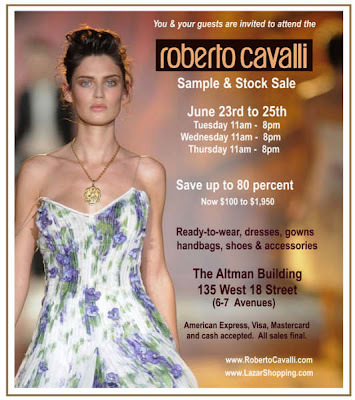 I guess these past Cavalli sales have been unauthorized because Roberto Cavalli is hosting their first 'official' sample sale in 3 yrs this week. Hopefully this means we see lots of stock! Per the marketing material, they will have over 10,000 pieces on hand, which means treasure hunting! Look for: RTW and couture for men and women. Women: dresses, gowns, pants, tops, skirts, jackets, jeans, t-shirts, shoes and handbags. Men: pants, shirts, jackets and shoes. Prices will be from $100-1,950, reflecting 70-80% off (retail $500-7,000). There will be dressing rooms. Print out the invitation and come to the private preview sale tonight! Cash or CC only (MC, Visa, Amex). Their Gilt Groupe sale ends today at noon, but starting now, everything on InhabitNY.com is 40% off (at least). Everything. Ridiculous. I'm just speechless... speechlessly shopping, that is! Today I met an old friend from Texas for brunch at Cookshop, which is conveniently close to Chelsea Market! Despite the rain, we hiked it down a block and around the corner and visited the Prive sample sale happening at Chelsea Market. The sale has TONS of clothes, mostly womens. Pretty much everything is $65 or less. Tanks, tops, dresses, t-shirts, denim from Edun, Iisli, T Luxury, Lewis Cho, J Brand, Free People, and a pair of Diesel shoes. If you are looking for summer clothes, i.e. lots of cotton camis/thin straps/airy material, you will find gold here. For men, there's a long row of t-shirts, and Ben Sherman and Original Penguin short-sleeve button-down shirts and pants along the back. I walked away with a T Luxury tank top for $15! Due to the rain we nixed walking around the Meatpacking District and cabbed it straight to the Hugo Boss sale held by Soiffer Haskin. The sale is really really good for men. Mens t-shirts and knits are $45, shoes are $99, button-down shirts $59.99, polos $39.99, and most have discounts for buying more than 1 item (i.e. polos are 3 for $99.99, but $39.99 each). There are tons and tons of suits! Mostly around $400, all sizes. There were also messenger bags and duffle bags, priced $99+. Womens selection is very small, 6 racks of tops in all sizes ($39.99 each or 3 for $99.99), a few boxes of belts, handbags ($199+), and shoes ($99.99). There are fitting rooms in the back for men and women. If you love Hugo Boss, this is a MUST for you. I found 3 tops I loved (for $99.99, retail $515), and my (male) friend got a pair of leather loafers, a pair of ankle boots, a t-shirt, and 2 button-down shirts for a total of $377. Prive is currently hosting a summer sample sale for men and women. Featured designers include: Lewis Cho, Original Penguin, Josh Brody, Freedom is Natural, T Luxury, Nirvana, Iisli, Pink Polka Dot, Shumaq and others. Starting today, Taschen down in Soho is having a 3-day warehouse sale. If you need new coffee table books, or are looking for a gift for an artsy friend, there will be new, rare, out-of-print, and collector's books at 50-75% off. They may have been on display or exhibit slight damage, so be sure to check it out thoroughly before you walk out the door. YOOX.com is celebrating their 9th birthday! 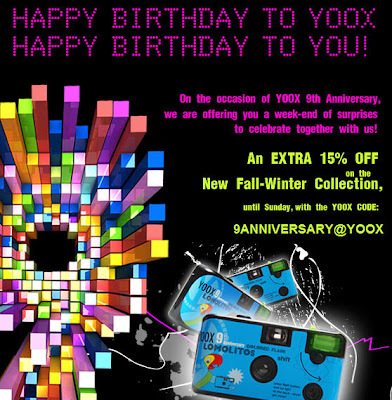 In celebration, use code "ANNIVERSARY@YOOX" to take 15% off the new Fall/Winter collection. However, even if you're not buying FW clothes yet, the code will get the first 5,000 orders a specially-designed disposable Lomo camera. Ends Sunday, Jun 21. Using my link also gets you free shipping. I ventured out into the pouring rain to check out the Shanghai Tang private sale. It did not disappoint. Most of the higher-end items were 50% off, which is pretty fair considering this is a 'private sale' and not a 'sample sale' (although the staff used the term 'sample sale' freely). For 50% off you'll find silk blouses, velvet jackets, silk pants, and silk camisoles, and silk cardigans, all decorated with either a mandarin collar or other Asian accents. Some wool items were also only 50% off, such as the top I got (below). There are also pajama sets available, although size M was sold out. For more than 50% off (sometimes up to 70% off), you will find cotton shirts (some sparkly t-shirts), wool sweaters, wool cardigans, and a very small selection of cotton tops. If you like Shanghai Tang bags, there were quite a few on sale against the opposite wall. Small cute clutches that retail at $280 are only half off, but the big bags that were in the $800 range were marked down to $240. In the back room, you'll also find a very small rack of kids clothes. For men, I saw a lot of pullovers and t-shirts, up on shelves against the wall. The mens' selection is probably 1/2 of the womens'. Prices looked more discounted than 50% for the few things I looked at. There are also cotton button-down shirts in the back room which are on sale for half off. 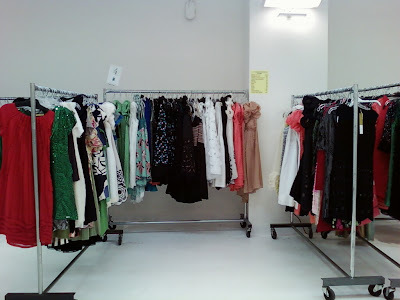 They are not allowing private/sample sale shoppers to use the dressing rooms, but recommend that you try things on over your clothes in the back area, so either know your size, or wear something relatively tight. From my personal experience, I would say trying it on is key because some things run really small! Overall a very cute sale, and I'm glad I went. I was a little disappointed they didn't have any house stuff or small accessories on sale, though. Ladies and gentlemen, it is time to stampede to your local Barney's if you have been on the fence about some sale items. Starting today: an extra 25% off. GO! You can thank me later. ABC Carpet & Home is having their summer tag sale! Happening now at all locations. Clicking on the image will open up their email in PDF format. 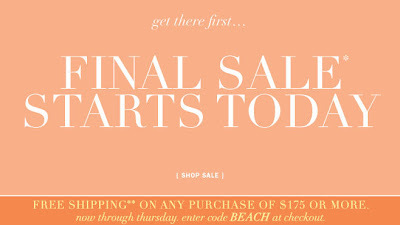 Going on now... you'll have to enter your name, email, and zip code to access the sale. All sales final. Ends Friday, Jun 19. 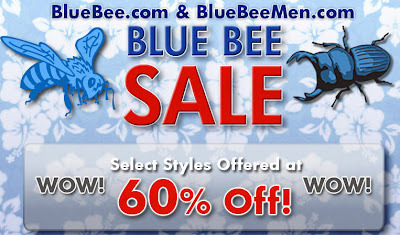 Blue Bee's sale site has discounted an additional 30% to now 60% off retail. Not too shabby. Free shipping if you go through my link. 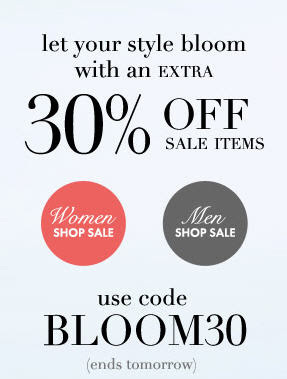 Use code "BLOOM" and take an extra 30% off Tobi.com's sale merchandise. Ends Friday, Jun 19. Update: The link is not very intuitive, and I think the overwhelming response has caught RM with their pants down. To check out the few bags on deep, deep sale, click here. You can use the links they provided, but you'll need to navigate to 'Handbags'. Update: as we could have predicted, RM' server is totally f-ed. I have no idea when it will even be back online. Maybe in a couple of hours? Note to retail websites: if you are are a popular brand with a legion of loyal followers, you might try boning up on some bandwidth best-practices or learning from past FAIL case studies (see: Gilt) before jumping onto the online sample sale bandwagon. The sale is going through Sunday night, and they'll be adding new styles, but make sure it's what you love- all sales are final. 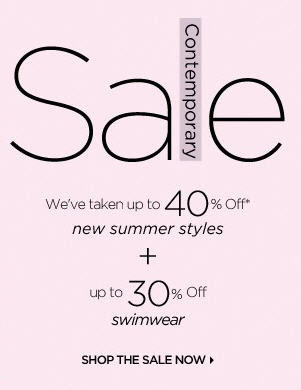 Saks has discounted some items up to 40% and swimwear is up to 30% off. This morning I hit up the Catherine Malandrino sample sale. I got in line around 10:30, and there were maybe 40 girls in front of me. They are carefully monitoring occupancy, letting people in only 10 at a time; it took me about 20 minutes. I would highly recommend that you not bring anything but your wallet if possible. Otherwise you waste precious minutes checking in your bag or coat. A quick glance into the bag/coat check room revealed impressive rows of bags: Gucci, Miu Miu, YSL... girls in New York definitely have style! Should you go? Yes! The selection is fantastic, honestly, and the price points are good. 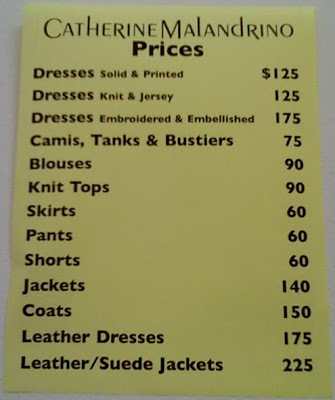 The staff is lovely and let me take a photo of the pricing list, and for dresses, you're looking at a 65-75% discount. 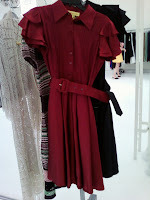 After much deliberating, I scored a red silk shirt dress for $125 (retail $475). There were only a few leather dresses though, so don't get too excited. The area is expansive and it takes a while to get oriented. There's an area for tops, then skirts (very few) and a rack of pants. Then the dresses are in 2 'rows': one of P/S/M/L and one of sizes. In the far back corner there is even a little niche of samples, size S. Dressing room is large and communal, so wear good underwear! Oh, and if you want a dress, go soon. I will probably swing by again on Friday to dig through tops (the worst organized area, and you'll see why when you go). Let's hope they do a last-day discount! A very large space, filled with Catherine Malandrino goodies! I'm sorry! I should have posted this earlier! Plus discounts for home purchases. Ends Thursday, Jun 18. Savvy & Co is hosting an online sample sale of Qi Cashmere. Prices look like they will be around 60% off. Labels: cashmere, sample sale, Savvy and Co. The firesale has begun! Take an extra 50% off sale clothing (but not final clearance). After staying at a St. Regis for the first time ever (yes, I know, but I was/am pretty committed to the Four Seasons), I discovered Remede bath soap. It is lovely. It smells heavenly, cleanses beautifully, and leaves me very well moisturized, squarely displacing my current soap, Savon de Luxe, which is made of goat's milk, honey, and crushed almonds. Despite my counter of La Prairie (purchased during Saks' F&F of course), I still had a very hard time ponying up $10.13 per bar of 2 oz soap (after beauty.com's F&F discount), and faced an even bigger crisis when I ran out: do I pay full retail (that would be $12.67 per bar)? Economically, that is nuts. Nuts. Is a bar of soap ever worth more than $7? And mind you, this is a teensy bar, not Bliss' ginormous clown soap or even Fresh's generous turkey eggs. So, reluctant to find a gem only to let it slip away, I did something I have never done before: I went on eBay. I had my reservations, but it's soap, I figure. It can't be that bad. Even an expired bar shouldn't burn my skin off or leave me with horrible chemical reactions. So I went for it. 9 bars for $50 ($57.50 after shipping, which equals $6.39 per soap). I was pretty pleased, but at the same time, afraid. Is it too good to be true? The soap arrived today, and unluckily, maybe, I had it shipped to my office. Let's just say they handled it with suspicion because it came in a box used for packaging ground beef. It actually had beef expiration stickers on it, was scribbled over in permanent marker, and 'finished' with a flourish of 2 rubber bands. Upon handing it to me, the mail person said, make sure it's not ticking! The product: these things definitely came from TJMaxx, scraped off price tags and all. Boxes banged up all to hell and the soaps themselves are probably old but thankfully unmolested and intact (and still smell great!). Would I do this again? Probably not. I'll just have to go back to my more affordable goat's milk soap. Lesson learned: only gamble on beauty products that won't horribly disfigure you, but even still, it may not be worth the risk. 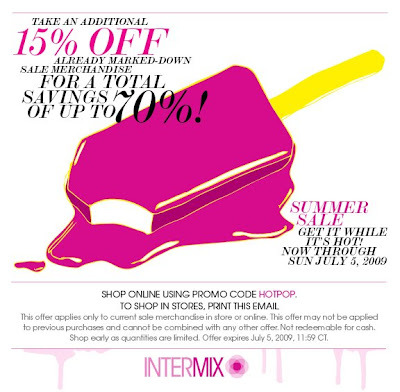 Get an extra 15% off the sale stuff at Intermix. Use code "HOTPOP" to shop online, or print out the image to shop in-store. Ends Sunday, Jul 5. 6/18–6/20 At the Vena Cava sample sale, leather leggings are $400 (originally $900), the text-print chiffon T-shirt dress is $175 (originally $435), and the brocade-and-silk bustier dress is $250 (originally $550). 33 W. 26th St., nr. Sixth Ave., fifth fl. ; Th–F (11–7), S (noon–6). Net-A-Porter.com is having another push for unloading summer merchandise. Starting today, Clothingline is hosting a brother and sister sample sale. Paul & Shark is having their sample sale! You'll find (all for men) lightweight and heavy outerwear, short-sleeve polos, jeans, trousers, swimwear, wool and cotton sweaters, select cashmere outerwear and sweaters, hats, 100% cotton woven shirts, and shoes. Sizes are mostly on the larger side. Why fight a good thing? Daily Candy has provided a succinct list of sales this week. Included: Walter, Tracy Reese, Eugenia Kim, Rag & Bone, Dolce & Gabbana/D&G, Diptyque, Simon Showroom, James Coviello, Generra, Shoshanna/Anlo, Abaete, Christopher Fisher, Hugo Boss, Matta, and Amanda Uprichard. Why: Tops, jackets, and frocks are up to 75 percent off. We love the mint ruffle and tulip silk dresses for $94 (reg. $268). When: June 16-18. Tues. & Wed., 10 a.m.-7 p.m.; Thurs., 10 a.m.-5 p.m.
Why: Floral skirts, strapless tops, and dresses are more than 50 percent off. The first 400 guests snag a goodie bag. When: June 16-18. Tues. & Wed., 8 a.m.-7 p.m.; Thurs., 8 a.m.-2 p.m.
Why: Hats, belts, and headbands are 80 percent off. When: June 15 & 16. Mon. & Tues., 10 a.m.-7 p.m.
Why: Cashmere sweaters are $99 and under; leather jackets are $350 and under; jeans are $79 and under. When: June 18-20. Thurs.-Sat., noon-8 p.m.
Where: 100 & 104 Christopher St., b/t Bleecker & Hudson Sts. Why: Get your nails did and claw at those silk leopard-print blouses we have come to love (were $695, now $350). Canvas Animalier totes were $1,350, now $675. Bags, suits, cocktail dresses, jeans, and men’s stuff topples the 70 percent mark. When: June 16-21. Tues., Wed. & Sun., 11 a.m.-7 p.m.; Thurs.-Sat., 11 a.m.-8 p.m.
Why: Forty to 90 percent off deluxe candles, perfume, and body washes. When: June 18 & 19. Thurs., 9:30 a.m.-6 p.m.; Fri., 9:30 a.m.-4 p.m.
Why: Adorable designer duds from Wren, laid-back C&C, Goldsign, and Paul & Joe are wholesale and below. When: June 15-17. Mon.-Wed., 10 a.m.-7 p.m.
Where: 95 Fifth Ave., at 17th St., 3rd flr. Why: Accessory designer and collaborator with Ana Sui unleashes ten years of archives (sweaters, hand-knits, fab textiles, spring line) at sample sale prices. When: June 17-19. Wed.-Fri., 10 a.m.-8 p.m.
Why: Slub cotton V-necks and polos for guys are $30-$35. Cotton tanks and racers for ladies are $15. Tops and dresses are up to 60 percent off. When: June 17-19. 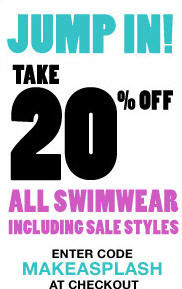 Wed.-Fri., 10 a.m.-7 p.m.
Why: Up to 75 percent off swimwear and dresses. Up to 70 percent off denim shorts and skinny jeans. When: June 17 & 18. Wed., 10 a.m.-6:30 p.m.; Thurs., 10 a.m.-5:30 p.m.
Why: A cocktail party and auction of popular pieces kicks off the three-day sample sale. When: June 17-20. Party, Wed., 6 p.m. Sale, Thurs. & Fri., 11 a.m.-7 p.m.; Sat., noon-6 p.m.
Where: 117 Crosby St., b/t Houston & Prince Sts. Why: Cashmere everything! Men, women, baby, and home goods are up to 80 percent off. When: June 18-21. Thurs.-Sat., 10 a.m.-8 p.m.; Sun., 11a.m.-5 p.m.
Why: Up to 70 percent off duds (in lots of sizes). When: June 20-24. Sat. & Sun., 9 a.m.-6 p.m.; Mon.-Tues., 9 a.m.-7 p.m.; Wed., 9 a.m.-5 p.m.
Why: Cotton wrap dresses for $92, batik silk dresses for $108, handmade leather sandals for $30, and 50 percent off home accessories. When: June 23-25. Tues.-Thurs., 11:30 a.m.-7 p.m.
Why: Perfect summer silk tunic dresses in bright colors are $60. All jersey dresses are $45. Bargain bins start at $25. When: June 24-26. Wed. & Thurs., 10 a.m.-6 p.m.; Fri., 10 a.m.-3 p.m.
Where: 226 W. 37th St., b/t Seventh & Eighth Aves., 3rd flr. (212-719-0320). Revolve Clothing has bulked up their sale dept. Check it out. This morning on my way home from my doctor (who is perfectly situated across from Bally and Tod's and 1 block away from Barney's), I popped into the DKNY boutique to see what I could see. The upstairs has a TON of things on sale! DKNY Jeans (pants, t-shirts, tanks), DKNY Pure (cotton and silk tops, pants, and skirts), and regular DKNY (tops). Discounts are about 40% off. I also ducked into Barney's to check the shoe sale selection (40% off). There is still tons left, although not all are must-haves. Louboutins, Manolos, Pradas, Zanottis, and even a few Chanels, but the styles are very 'fashion-forward'. Nothing subtle is left, although the Chanels were all gorgeous. This is a MUST if you wear size 5 or 5.5 or even 6-- those shoes are the most unmolested and plentiful. If there's something you like but feel slightly ambivalent about, you can take a gamble and hold out for the additional price cut (probably around 4th of July). 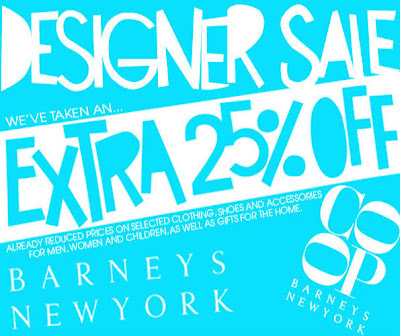 Or if you want rock-bottom prices, hold out for the Barney's Warehouse Sale which starts Aug 20! If you think you could do with more graphic and tongue-in-cheek tees, log on for David & Goliath's 60% off t-shirt sale on Saturday. Prices will be automatically marked down. 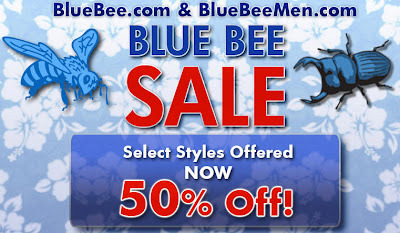 BlueBee's sale has gone down to 50%. Free shipping if you go through my link. Starting Saturday, Tumi will be having their F&F event: 25% off everything, including sale. So, if you have any summer travel plans coming up and you need some new jet-setting luggage, might be time to have a looky-loo. To get the discount online, go through their email link. You'll also want to print it out if you're going to shop in-store. 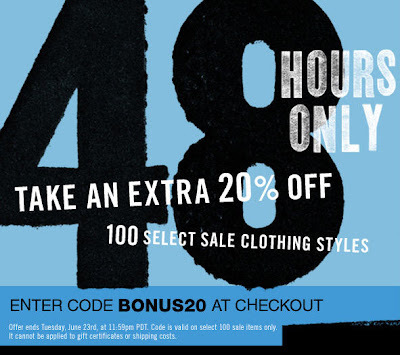 Ends Sunday, Jun 21. Woohoo! BCBG is doing a F&F for the first time ever! Take 30% off your purchase online using code "FRIENDS30" or print out the email to shop in-store. This even works on sale merch :) Unfortunately, this will not be valid on Herve Leger or in the outlets. However it will work at certain BCBG departments in Dillards, Macy's, or Lord & Taylor. Ends Sunday, Jun 14. Incidentally, Lord & Taylor's F&F is going on now-- print their coupon to get 25% off your purchase in-stores (or 10% off beauty). Ends Sunday, Jun 14. ***The million-dollar question: will they honor both the BCBG and their own F&F discounts? ShopBop will take 20% off your swimwear (even sale swimwear) with code "MAKEASPLASH". Ends Sunday, Jun 14. Oops, this one slipped by. Per NYMag. 6/8–6/14 Women’s five-pocket jeans, denim skirts, jackets, and men’s jeans are $70 (originally $125-$275), and men’s shirts, sweater’s and kid’s jeans are $20-$40 (originally $62-$300) at the Earnest Sewn sample sale. 260 Fifth Ave., nr. 28th St. (212-242-3414); M (1–8), T–F (10–8), S (10–7), Su (10–3). eLux is doing +40% off sale accessories! Today only, and remember, final sale. 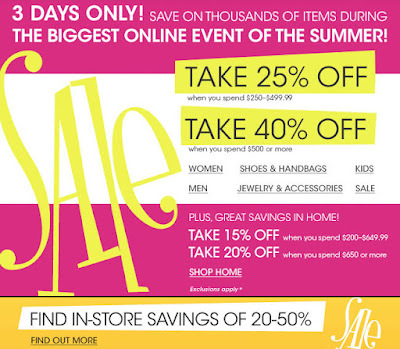 Starts today, their "sale of the season"! Free shipping and returns too. Update: I got some sample price points. 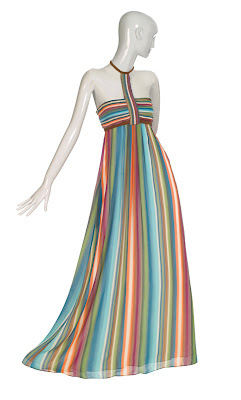 The dress below, which retails for $695, will be $125. Overall prices will be 75-80% of retail. This sale is being hosted by Savvy & Co.
Firstly, for all those not living in NYC, Catherine Malandrino will start their F&F event Thursday. In-stores and online, 50% off the spring/summer collection. To shop online, use code "FRIENDSANDFAMILY". Ends Sunday, Jun 14. However, for all NYC gals, it gets better! Next week is the SS sample sale! Labels: Catherine Malandrino, friends and family, online sale, sample sale, Savvy and Co. 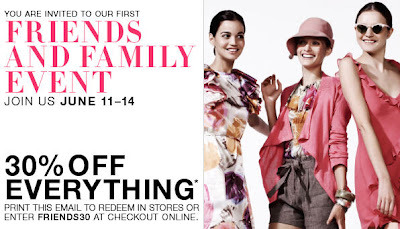 I know it seems as if Off 5th runs a different, really good promo every weekend, but this F&F promo is pretty good. It's a consistent 30% and works on EVERYTHING, even clearance. They claim my coupon is one-time use only, but I have seen other people post the exact same one, so who knows. (The coupons I got in the mail do all have unique scan codes.) Print the online version here to go shopping! Ends Tuesday, Jun 16. Brian Atwood and Miguelina are hosting a sample sale. Where: 20 W. 36th St., nr. Fifth Ave., sixth fl. 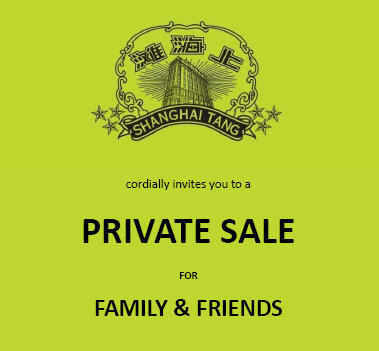 Case in point: "Shanghai Tang friends and family private sale". First off, I adore Shanghai Tang. If my NYC apt dining room was kept stately and permanently set, I'd have ST napkin rings. (Instead the dining room table is where piles of old mail collect). Secondly, I'm uber jealous that the boutiques in Asia are having big sales right now, Hong Kong in particular. So, without further adieu, here are the details. The email specifically states you need a print-out to get in, so go prepared. It is also first-come-first-served, so I am guessing there will be no replenishing. That means I'm there at 10:30AM next Thursday. Cash or CC only, no Amex. If you like to see clothing modeled on a celeb before it makes it into your closet, ShopIntuition seems to have really outdone themselves. Use code "SUMMERLOVE" and take 20% off your order through Sunday, Jun 14. If you are in close proximity to a W Hotel with a store (list is below), take a print out of the email, or simply mention their 'secret sale' and get 20% off through Monday, Jun 15. In-stores only, not online. Cash or CC only. Dressing room closes up to one half hour prior to close of store. Our entrance and selling floor closes up 10 minutes prior to close of store. You know what they say of something that sounds too good to be true... Here is a new sale that I'm seeing posted in various places. Could be a dream, could be a bust. If you make the trip, please report back! Inquiring minds want to know! Economic conditions have forced one of Italy's finest shops to close their doors. Fantastic selection of one-of-a-kind couture pieces from Spring/Summer '09 here at 70% off. Hundreds of pieces including ready-to-wear and accessories, from the hottest runways in Europe. Dresses, jackets, skirts, pants and sportswear in all sizes and styles. Full fitting rooms are available. Inhabit NY is looking to move some tank inventory! Choose from 5 styles-- all $38 (retail $128). Sheandme is offering 50% off with code "JUNE09" through Sunday, Jun 14. I just have to say that the Almost Bare Bralet I got from them a year or so ago is one of the best purchases I've made. 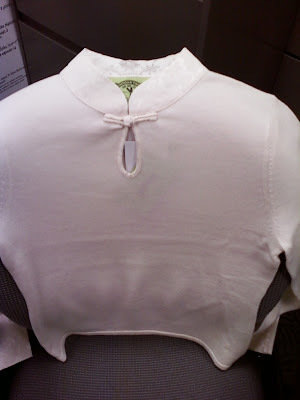 It goes perfectly under tops, cashmere sweaters, or buttoned-up cardigans-- very comfortable and not bulky, esp when a full underlayer would be too hot. If you are dreaming of visiting a far-flung romantic destination but only have $1000 in your bank account, dream no more. For travel between now and Nov 30, Singapore Airlines is offering tremendously low airfare from major US departure points (NY, LA, SF, Houston) to cities like Moscow, Hanoi, Bali, and many cities in India for $579-879. And when they say $879 for a flight from JFK to Sydney, they mean it. All taxes are already priced in. 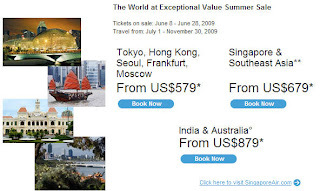 Of course, the low rates are somewhat inconsequential when you consider that you'll be flying on Singapore Airlines, quite likely the best airline in the world, and regularly ranked in the top 3 for service. Trust me, this is no Ryanair-- a first class ticket from JFK to Hong Kong will run you around $12,000. My only complaint is that they've ruined Incanto by Ferragamo for me forever. Every time I even catch a whiff of it, I am reminded of the airplane bathroom. Still, better than urine! I had no idea H.Stern was a Brazilian company until my DH told me, which also surprised the heck out of me b/c since when did DH know anything about expensive jewelry before he met me?!? :P All along I thought it was just an upscale contemporary American shop. Not at all. Apparently in Rio, this brand is a big deal. So it only makes sense that this is going to cause a minor bit of panic, seeing as Americans are infatuated with all things Brazilian right now. DH (who was born and raised in Rio), incidentally, finds it quite hilarious as Brazilians themselves are concerned with all things US. During H.Stern's private sale you'll find gold jewelry with colored gemstones, including cocktail rings, classic diamond solitaires or pave jewels, as well as vintage styles. 25% off entire purchase with code "SUMO". Online only for US/Canada. 25% off entire purchase with code "FNF25". 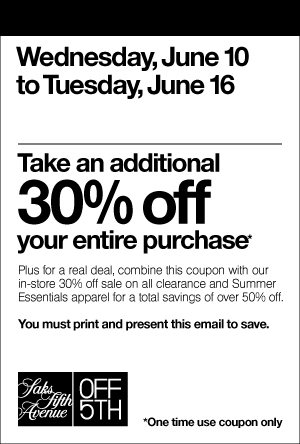 Print email to shop in-store. 20% off BE and MDFormulations with code "SHARE". Online only unless you know someone. 25% off with code "SUMMER1". Free shipping $60+. 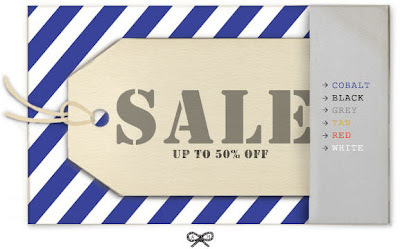 ShopBop has bulked up their sale section! I may be a week late on this, but Hugo Boss boutiques are finally doing the 40% off summer sale. I popped in and got a gorgeous $375 skirt for $225! If I could wear Hugo Boss to work everyday, I'd be a happy woman. I figure a closet of 20-25 outfits would be $12,000-15,000. That's doable, right? While at Time Warner Center I also spied a '50% off the entire store' sign in Sisley. Today in the wet dreary rain, I dragged my coworkers to redbag, a boutique I've heard all about but never actually visited. I was/am especially peeved that I didn't know about it before, when I used to work around the corner(!!!). Bygones. Upon entering, I was very pleasantly surprised to see that the store actually met my expectations. Bins of C&C California tops for $5 were in the front and back of the store, and there were generous racks of Walter summer dresses for $80 (retail ~$260). 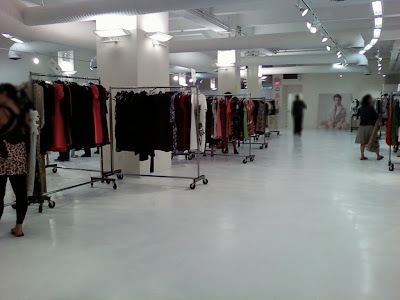 Along the other wall was a generous selection of Nicole Farhi (previously the designer for French Connection) clothing priced $15-75. Throw in some Carlos Miele and random off-label tops for $5, and I think we have a winner! I was told that in a couple of weeks, they will be featuring a shipment from Tracy Reese. A cash-only Hardtail sample sale starts next week! Time for some yoga gear! Incidentally, this looks like it is right next to redbag-- a very nice little bonus. For the first time (that I know of), the Carolina Herrera sample sample will include bridal! For those who aren't shopping for a gown, Carolina Herrera and Rena Lange clothing up to 85% off.